Hello, dear readers! 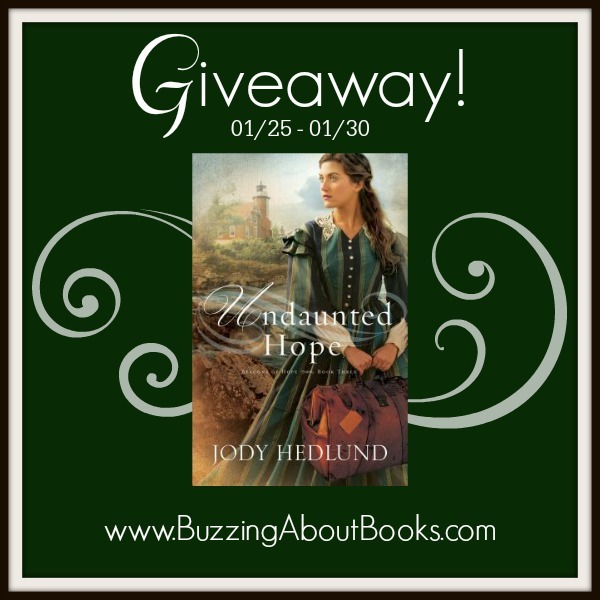 I’m so excited to welcome Jody Hedlund here today! She has graciously answered a few questions about her latest release Undaunted Hope and is offering a print copy for giveaway. You can read my review of this captivating story here. Please enjoy the interview and enter the giveaway below! Welcome, Jody! How did you come up with the idea for Undaunted Hope? For this third book in my Michigan lighthouse series, I wanted to pick a location that was different than the other books. The first two books, Love Unexpected and Hearts Made Whole, are set in the “Mitten” of Michigan. So to add variety to the series, I decided to place Undaunted Hope in the Upper Peninsula on Lake Superior. In doing my research of Michigan lighthouses, I learned that there are lighthouses dotted all over the coast of Lake Superior since it was such a treacherous lake to traverse and an important place for steamers due to the rich natural resources that were available. As I studied the various lighthouses, I finally landed upon Eagle Harbor Lighthouse in the Keweenau Peninsula because not only was the area rich in resources, but it was rich in history and the makings of a really great story! What special research did you do in writing Undaunted Hope? As I wrote this third book in the Beacon’s of Hope Lighthouse Series, I had the wonderful privilege of visiting Eagle Harbor and the lighthouse that serves as the setting for this book. In fact, I was able to stay for a whole week in the assistant keeper’s cottage that now sits next to the lighthouse. The large covered front porch of the assistant keeper’s house overlooked Eagle Harbor and Lake Superior, so it was a gorgeous view! Every morning I woke up to the sound of the crashing waves and every evening I watched the sunset. It was one of the most beautiful, peaceful places I’ve ever stayed. Not only did I get to do in-depth research on the lighthouse (and walk around inside it as many times as I wanted! ), but I also was able to research the entire area taking lots of pictures of the lake, flowers, wildlife, and the numerous waterfalls throughout the peninsula. It’s a remote wilderness area of Michigan, sparsely populated, and cold! I visited at the end of June and brought short sleeve shirts. I had to wear sweatshirts almost every day instead. This is now the sixth book that you’ve written with a Michigan setting. What draws you to write stories set in Michigan? I’ve lived in central Michigan for the past sixteen years. All but one of my five children have been born in Michigan, and this is where I’ve raised my family. So Michigan definitely has a special place in my heart. Not only has it been a wonderful place to raise a family, but it’s also a beautiful state. Michigan is a peninsula and is bordered by 4 of the 5 Great Lakes, giving it approximately 3,200 miles of shoreline which is the most of any state except Alaska. Michigan not only has lots of beaches and sand dunes and hiking trails and state parks, but it also is home to the most lighthouses. Aside from the beauty of the state (which makes for very picturesque book settings! ), Michigan has a rich history due to the lumber and mining era that attracted many settlers to the state, but also attracted plenty of colorful and dangerous characters as well. What have you enjoyed most in writing this lighthouse series? Over the past couple of years of writing this series, I’ve thoroughly enjoyed getting to visit numerous lighthouses throughout the state. Not only have I attempted to visit the lighthouses that are used as settings for the books, but I’ve also been inspired to visit many others. Every time I do, I learn a little bit more about how lighthouses were operated and have come to realize that they’re all so unique. During the past summer of 2015 I toured several lighthouses including: Tawas Point Lighthouse, St. Joseph Lighthouses, and Mackinac City Lighthouse. Each time I climb a tower, reach the top, and gaze out at the spectacular view, I’m always amazed by the beauty. I never tire of the experience and can completely understand the fascination so many people have with lighthouses. I think I caught the “lighthouse bug” and will forever be visiting them! You have a fourth lighthouse book releasing in June of 2016. Can you tell us a little bit more about this story? Is it connected to your first three lighthouse books? The fourth book is titled Forever Safe. Like the others, it can completely stand alone. There’s no need to read the others first to enjoy the story. However, the main character in Forever Safe does make an appearance at the end of the third lighthouse book, Undaunted Hope. I won’t say who it is, so that I don’t spoil the surprise for those who haven’t read Undaunted Hope. But I hope that readers will be excited about this particular character getting a story in Forever Safe. 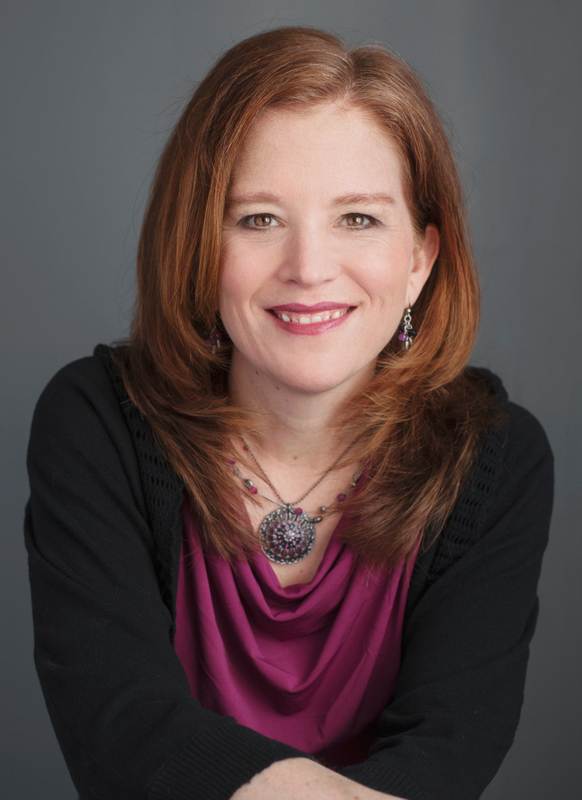 Thank you so much for sharing this wonderful interview and giveaway, Jody! Do you have any parting words? 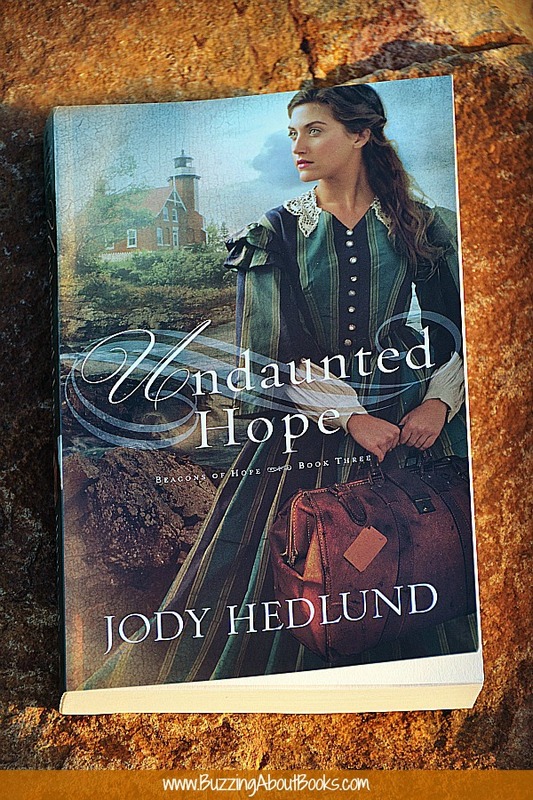 One lucky reader will win a print copy of Undaunted Hope! Comment about a lighthouse you have visited, and be sure to include your email address in your comment. The giveaway ends Saturday, January 30 at 11:59 p.m. CST. The winner will be drawn and announced on January 31. Follow this blog, Buzzing About Books, and/or share the giveaway via social media. Be sure to let me know what you’ve done to earn additional entries! Jody said she caught the “lighthouse bug” Have you visited a lighthouse? Do you have a favorite or one in particular you would love to visit?